Once in a while, a customer will call and ask if cutting coils is a good idea. Cutting certain coils can be a good way to lower your vehicle, but you need to keep a few rules in mind to avoid permanently destroying your springs. The design of the end of the spring determines if it can be safely cut. If it has the right end, it is OK to cut it. Tangential– where the end of the coil continues to twist off into space. A spring with a tangential end would fall over if you tried to stand it on its end. Pigtail – the last coil of the spring is the square type but has a much smaller diameter than the coils in the body of the spring. 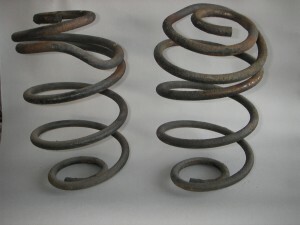 The type of ends a coil spring has is determined by how the springs are mounted in the suspension. A coil spring can have 2 of the same ends or it can have 2 different ends. The only coil springs that can be safely cut are coil springs with tangential ends. Because Square ends and Pigtail ends are designed to make full contact with their mounting points, they would have to be re-shaped after they were cut. But in order to re-shape them the steel would have to be heated and heat is a spring’s worst enemy. So, Coil springs with Square or Pigtail ends can not be safely cut. It only takes 400 degrees F to start annealing spring steel. When springs anneal, it’s steel begins to soften and a soft spring can not hold up your vehicle. You, the spring owner, can not do anything to make a soft spring hard again. A heated spring is a ruined spring. You’re going to need safety googles and a hacksaw or a cutoff wheel to cut your coil. OK, your springs have tangential ends, you found a hacksaw and some safety goggles. Now the fun part. How much do you want to cut off? The first thing you need to know is that cutting a coil spring will not only lower the vehicle, but it will also stiffen the spring making the ride and handling a bit firmer. But this is a good thing because lowering a vehicle reduces the amount of suspension travel. A stiffer spring will help reduce bottoming out. A safe place to start is by measuring how much you want to lower the vehicle. Then cut 1/2 that measurement off the length of the springs and reinstall them. Then take her for a drive, and drive it like you stole it to get the springs well worked and seated properly. Now check your ride height. If she’s still too high, repeat step 1 until you get the look you want. Remember, you can always take more off, but you can never make them longer. Because as a vehicle is lowered, the amount of travel left in the suspension before there is a jounce, metal to metal contact, condition is reduced also. Too much lowering can cause other parts of the vehicle to hit each other, and this would be a bad thing. So we say, and only do 2 Inches so this problem does not occur. And a final bit of advice: Don’t go perpetuating the old myth of touching a torch to them until she sinks to where you want her.